Should we use antibiotics in feline urethral obstruction (FUO)? The use of antibiotics in FUO continues to be a topic of debate, but this really is dictated by the signalment, history, clinical signs, and of course – diagnostics. 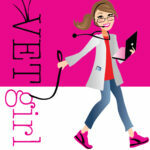 In general, we here at VETgirl prefer not to use antibiotics while the patient has an indwelling urinary catheter set (UCS) due to the risk of causing a more resistant urinary tract infection or contributing to pyelonephritis (although data on this is sketchy). That said, iatrogenic infection can develop as a direct consequence of catheterization, despite our best attempts to use aseptic technique during the unblocking process. Ideally, the use of antibiotics should be limited for use in the patient once the catheter has been removed (or pending urine or catheter tip culture at the time of removal). So, for most "uncomplicated" cases of FUO (e.g., the young, healthy male cat), we don't recommend the routine use of antibiotics while the patient has an indwelling urinary catheter. That's because the likelihood of a primary urinary tract infection (UTI) being present is less than 5%. If it's a healthy young patient with a UCS in place, ideally avoid the use of antibiotics until you pull the UCS. You can consider culturing the urine as you pull the UCS (or even the tip of the catheter) prior to discharge. (Most of my clients can't afford the $200 for this culture, however). That said, we know that older cats presenting with FUO (> 10 years of age) often present with a UTI (50%) or neoplasia. If the patient is older (e.g., over 8-10 years of age), has a positive urine culture, has evidence of bacteriuria, is a complicated or sick patient, if the unblocking procedure was grossly contaminated, etc., then the use of antibiotics is likely warranted while the UCS is in place. Also, regardless of what age the patient is, if they start to show signs of infection (e.g., fever, pyruria, bacteriuria, etc. ), renal pain, or sepsis while hospitalized, a urine sample should be obtained for culture (at least look at it and Gram stain it, dude!) and antibiotics initiated promptly (Lane 2012). If there is an absolute UTI diagnosed at the time of the FUO, then antibiotics are used immediately. Ideally – we prefer to wait until the catheter is removed before starting antibiotics as forementioned, but when in doubt: do what's best for the patient. I was just wondering what you thought about the use of Convenia in catheterized cats? We routinely use convenia for our FUO cats that are catheterized, one for infection risk, but also because we seem to see convenia help with cystitis cases. Any thoughts? Thanks! This will be case selective, but as a general statement, with idiopathic sterile cystitis, unless a UTI is diagnosed via urinalysis/culture, OR there is a significant concern for a specific patient’s underlying illness or risk of iatrogenic infection during traumatic catheterization, the empirical use of antibiotics is not recommended for many reasons, notably the risks of MDR, hospital acquired infections and long term resistance. Is it possible to have the reference for the less than 5% rate of primary UTI? 1. Osborne CA et al. Feline lower urinary tract disorders. Definition of terms and concepts. Vet Clin North Am Small Anim Pract. 1996 Mar; 26(2): 169-79. 2. Buffington CA et al. Clinical evaluation of cats with nonobstructive urinary tract diseases. J Am Vet Med Assoc. 1997 Jan 1; 210(1): 46-50. Urinary tract infection due to indwelling bladder catheters in dogs and cats. Barsanti JA, Blue J, Edmunds J.
Urine samples were collected from 27 dogs and 4 cats with indwelling urinary catheters connected to a closed system. Twenty-one animals had sterile urine at the initiation of catheterization. Eleven of these 21 animals developed positive urine culture after 4 (mean) days (range 1 to 10 days) of catheterization. Infections persisted after catheter removal in 6 of 8 animals. The 10 animals that did not develop bacteriuria had a shorter duration of catheterization (3 days vs 12 days, mean). Antibiotics (chloramphenicol, trimethoprim/sulfonamide, cephradine, lincomycin, gentamicin, or ampicillin) were used during the period of catheterization in 17 of 21 animals, 8 of which developed bacteriuria and 9 of which did not. Ten animals had bacteriuria at the initiation of urine collection for culture. The type of bacteria changed during the catheterization period in 6 animals, all of which were given antibiotics. Bacteria isolated from animals given antibiotics seemed to become increasingly antibiotic-resistant. For one, the study is almost 30 years old and only involved FOUR cats. It mentions bacteruria, but I do not see pyelonephritis mentioned (but maybe in the full study??). Of the 21 with sterile initial urine, 17 given antibiotics, 8 developed bacteriuria and 9 did not . I agree you need to evaluate it on a case by case basis, but I do not see where this study confirms that antibiotics give during time of catheter placement increases incidence of pyelonephritis. Thank you. Great point – this wasn’t directly stated in the paper, but the general recommendation by the majority of specialists is that you are creating resistance with the presence of an indwelling catheter. Particularly with feline urethral obstruction, I think this is important as MOST of these cats did NOT have a UTI to begin with (<2%). Hope that helps!